More than 2,000 singers across the state registered to audition, but it’s so notoriously rigorous that only 1,717 of them completed the process. Less than 30 percent were selected, and Roaring Fork High School senior Cal Brannigan was among them. That’s not just a big deal for Brannigan — it’s a big deal for the school. Brannigan is the first-ever RFHS student to perform with the Colorado All State Choir. On Feb. 3, he performs at the Buell Theater in Denver in the men’s choir, but he will be rehearsing in Denver both Feb. 1 and 2 — as long as he gets through the second audition, that is. That means Brannigan has been rehearsing so that he will qualify to rehearse. In addition to practicing independently, he’s been meeting with his vocal coach, Marcia Kuhlman, at least once a week in the evenings to finetune his technique. Now the choir and drama director at RFHS, Kuhlman has previously served on the All State Choir board of directors, so she has unique insights to help Brannigan maneuver the high expectations that come with being selected to perform. “Colorado All State auditions are more competitive than most collegiate auditions,” Kuhlman said. In addition to a prepared classical solo, students must show proficiency in sight reading, scales and intervals, she said of the audition requirements. 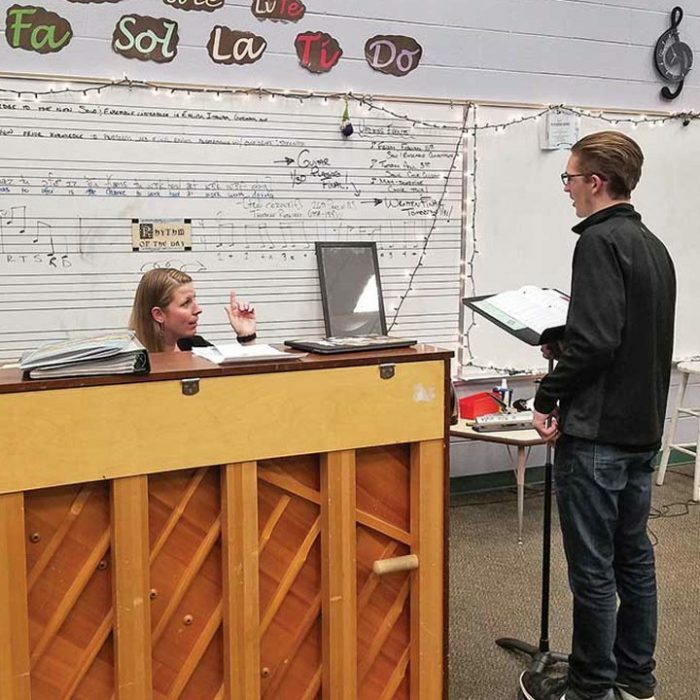 And because there is no formal curriculum for the performing arts programs at the high school, Brannigan’s choral training changed with every new director during his tenure as a student. That left him feeling unprepared for the auditions, he said. The work paid off. While Brannigan wasn’t shy about his nerves around the event, he’s become accustomed to managing high expectations — and not just in the choir room. An avid film enthusiast who aspires to pursue a career in the industry, Brannigan won a $1,500 scholarship through the 5Point Dream Project to direct and produce a 30-minute feature film, to be premiered in May at the Third Street Center. Generating that kind of excitement about the performing arts is at the heart of Kuhlman’s teaching ethos. For her, a big part of that is language, and she makes sure that commonality is felt in her classroom. “My students are speaking English, Italian, Latin, German and then the international phonetic alphabet, plus the international language of music,” she said, noting that much of classical choral music is not written in English. And while she speaks fluent German, Kuhlman has taken conversational Spanish classes at Colorado Mountain College in order to better connect with her Latino students.